Many may not know this, but this week is incredibly important. February 7-14th is Congenital Heart Defect Awareness Week! Plenty of information circulates to prepare parents for down syndrome, cleft lip, diseases caused by not vaccinating, and autism, but are you aware that nearly 1 out of every 100 babies is born with a heart defect. Many of these defects are minimal and may even correct themselves, but there are also many that are life-threatening. With advanced prenatal care, most of these defects can be caught in an ultrasound, before the baby is even born. However, in our daughter’s case, they missed it many times. In fact, after repeated ultrasounds because of an inability to see one side of the heart, they wrote 4 chambers down, despite the fact that she only had half a heart. My daughter was born with Hypoplastic Left Heart Syndrome. This means the left chambers of her heart were small and non-functioning. She was not even diagnosed until day 12, and she had her first reconstructive open-heart surgery the next day. Going from being a regular parent to one caught in a whirlwind in the cardiac intensive care unit (CICU) is overwhelming. Learning about the complex nature of this defect, and the special needs that a child with this defect has is terrifying. I felt shock, and I was always worried, watching each beautiful breath she took with gratitude. I learned how to read the machines and what her sat requirements were. My husband and I created medication logs and we documented her life for months. We became caregiving parents. Between this beautiful new child with a host of complications and a mentally ill child, we were exhausted, but we survived, and our little girl is 9 now. She has survived three surgeries, and each year, I speak about her condition to alert people to this common defect. 1/100 is a high number in my opinion. Much higher than the current statistics for other common defects like down syndrome. Knowledge is power, and I can say if you feel something may be wrong with your child, be adamant in getting a doctor to listen. It took 6 visits to get our doctors to finally admit us. My daughter was diagnosed past the date where most will die without treatment. She was in the lucky 5% that survive past 10 days. This is incredible to me. The most difficult aspect of her condition that I live with each day is that the future is so cloudy. We have been told her heart will eventually wear out as it is working twice as hard, and she has had so much work done, she will require a transplant at some point. This is a fact, but one that I try to forget. I can often pretend she has no problems as she acts like a typical 9 year old with a bit of an attitude at the moment. It is when the threat of a cold looms over us, or when she wants to do gymnastics moves around the house that I begin to panic. It is when she gets overheated so quickly in the summer that I want to squeeze her tight and never let go. I know her life has been borrowed by skilled doctors, and I fear what the future holds. This is why I want to bring awareness about the importance of having knowledge about heart defects. We nearly lost our chance to know this incredibly intelligent little girl, and I hope our story can help another family get that same chance. I remember all of it and what a beautiful miracle God let live. 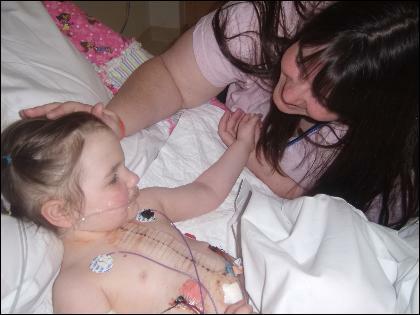 Bridgette is a beautiful child with a hugh heart for being born with only half a heart. I treasure each day She is in Our life. It wouldn’t have happened if it was not for parents who knew there was a problem and never gave up till the doctors figured it out. God bless the parents, the doctors and all the prayers. Thank you too God for such a special gift with both my grandchildren. They are both blessings.